We’d love your help. Let us know what’s wrong with this preview of The Drift by David Maxwell. In the quaint little town of Crystal Falls, surrounded by the majestic Rocky Mountains, a storm is brewing…. As the tightknit community fights to survive a blizzard like no other, more sinister threats, dark and duplicitous, lurk just out of sight. Embarking upon his first official mission, Ra sees himself as a rescuer, a hero, a man whose selfless efforts will save untold In the quaint little town of Crystal Falls, surrounded by the majestic Rocky Mountains, a storm is brewing…. Embarking upon his first official mission, Ra sees himself as a rescuer, a hero, a man whose selfless efforts will save untold lives and ensure a future where his people will flourish for generations to come. As he carries out his duties, he’s forced to face the cruel duality of good and evil. Firsthand, he witnesses that actions, no matter how noble the intent, can trigger disastrous outcomes, some irreversible. Struggling to undo what he’s done, Ra finds in himself a surprising capacity for empathy and discovers an emotion he’s willing to die for – love. In this electrically charged page-turner, David Maxwell, author of the highly rated Rebirth, takes us into an all-too-possible dystopian world where one group’s solution for survival threatens to destroy the lives of another. To ask other readers questions about The Drift, please sign up. I’ve been fortunate to have read for review a string of top-notch novels for Reader’s Favorite the past several weeks and “The Drift” by David Maxwell earned its way to the top of that list. In this stunning science-fiction thriller the town of Crystal Falls is hit with a winter storm of unbelievable proportion and intensity. The townsfolk struggle to survive and assemble in the local clinic. Following a series of hair-raising events, characterized by great acts of bravery and determination, it I’ve been fortunate to have read for review a string of top-notch novels for Reader’s Favorite the past several weeks and “The Drift” by David Maxwell earned its way to the top of that list. In this stunning science-fiction thriller the town of Crystal Falls is hit with a winter storm of unbelievable proportion and intensity. The townsfolk struggle to survive and assemble in the local clinic. Following a series of hair-raising events, characterized by great acts of bravery and determination, it looks like almost everyone has survived the worst… and that’s when the shite really hits the fan. “The Drift” is a strong, character driven story that touches on several emotional themes and personal discoveries as the actors struggle within a dystopian world in which an advanced societies strategies for survival and rejuvenation of their dying world, infringes upon and enslaves another. Mr. Maxwell is expert in building and defining his characters. Regardless of their place in the story… major or minor actor… protagonist or antagonist, he brings them to life with an unparalleled sense of verisimilitude. These actors are true to life and unforgettable. 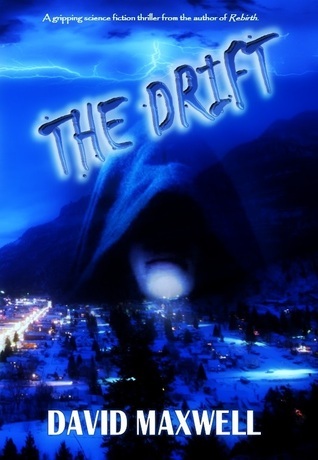 “The Drift” is a refreshing view of a familiar (for sci-fi fans) theme, told in compelling fashion, perfectly paced with each scene meshing and setting the stage for the next. You’ll find little to no “tell” in this story; it’s almost entirely “show.” I easily visualized every scene. As applicable, I felt love, empathy, sympathy, dislike, and/or hatred for every character. If I could reduce this review to a single sentence, it would be this—If you read only one book this year, make sure it’s “The Drift” by David Maxwell. Okay, wow. I read David Maxwell’s first novel, Rebirth, and enjoyed it. With The Drift, the author has really won me over. The plot was fantastic, well thought out and surprising. There were plenty of times during the course of the story that I had reservations (“How can this be?”) and I was afraid that the answers would either be unsatisfactory or completely missing (as sometimes happens in books). I was so happy to discover that all the questions that occurred to me throughout the book (and bel Okay, wow. I read David Maxwell’s first novel, Rebirth, and enjoyed it. With The Drift, the author has really won me over. The plot was fantastic, well thought out and surprising. There were plenty of times during the course of the story that I had reservations (“How can this be?”) and I was afraid that the answers would either be unsatisfactory or completely missing (as sometimes happens in books). I was so happy to discover that all the questions that occurred to me throughout the book (and believe me, plenty of questions get raised!) ended up not only being answered, but answered in a way that was not just satisfying but perfect. And without being at all predictable. Having said all that about the plot (and I refuse to say more because in this book it would be way too easy to give a spoiler), I don’t think I can say enough about the characterization. There are a lot of characters in this book, major and minor – a whole town’s worth. The author brings each of them their own personality and makes you feel you know them. Not only are the characters themselves vivid and believable, but the town of Crystal Falls is itself a character, fully and richly realized. In fact, the storm that descends on Crystal Falls at the beginning of the book is a well-wrought character in itself. Oh yeah, and I cried at the end (happy tears). You know you’ve got me when I get that involved in a story. I really enjoyed David Maxwell’s first novel, Rebirth, and now he’s truly hit it out of the park with The Drift! There are futuristic technologies, relatable characters, apocalyptic circumstances, and emotional surprises. The writing pulled me in and kept me on the edge of my seat. I felt every minute of the fear, hope, anguish, and joy the characters experienced as the story unfolded. The settings were vivid and the personalities colorful. One of the more interestin Science fiction at its best! One of the more interesting aspects to me was the notion that good and evil can be part of the same person and that situational challenges can create a very fine line between the two, at least in their own eyes. Stories within the story were compelling, particularly Holly’s and Jenny’s. I appreciated that this male author really captured the strength, intelligence, unique trials, and undeniable resilience of his female characters. Maddie’s “spit and vinegar” reminded me of my own grandmother and felt very real. Beyond the gripping action, suspenseful turns, and intense emotional journey, this is a fascinating and complex story with undertones and overtones of societal challenges we grapple with today. Enveloped in this exciting technological thriller, there are messages of tolerance, loyalty, equality, personal responsibility, and the common threads that bind us to our communities and our world. I’d love to see this one on the movie screen! "The Drift is a strong, character driven, magnificent story that touches on several emotional themes and personal discoveries as the actors struggle within a dystopian world.... Mr. Maxwell is expert in building and defining his characters. Regardless of their place in the story - major or minor actor, protagonist or antagonist - he brings them to life with an unparalleled sense of verisimilitude. These actors are true to life and unforgettable. This type of description book ends a brilliant tale which begins with a shock and journeys through adventures which link to reminiscences. For me, as a teacher, the use of language is compelling, being used so naturally and yet with such control. Fully recommended. Meh. Something made me keep on reading through to the end, but this book just didn't do it for me. The very end was predictable. The characters weren't engaging enough. The present and future were too incompatible. I didn't hate it, but I wouldn't read it again. Trapped by a record blizzard, the residents of a small American town are rescued from death by time travellers. The story opens with the town of Crystal Falls preparing for an unseasonal heavy snowfall. A range of well-developed characters are introduced as they try to help each other survive. It’s interesting and engaging stuff, but it does take a while to get to the science fiction content. Don’t panic, it eventually shows up and is pretty good when it arrives. The writing is good, very readable Trapped by a record blizzard, the residents of a small American town are rescued from death by time travellers. The writing is good, very readable throughout, with few editing errors. This story took several unexpected twists. It's unusual in that it has a strong finite ending. The characters were good people at heart and loyal to a fault. David Maxwell is an author of award-winning science fiction thrillers. David provides his readers with thought-provoking, mind-bending thrills that take technological concepts to the next level. A retired veteran of the United States Air Force, David held critical positions where he implemented, maintained, and managed some of the world’s most leading edge technology. He served in Desert Storm and David Maxwell is an author of award-winning science fiction thrillers. David provides his readers with thought-provoking, mind-bending thrills that take technological concepts to the next level. A retired veteran of the United States Air Force, David held critical positions where he implemented, maintained, and managed some of the world’s most leading edge technology. He served in Desert Storm and directly supported the War on Terror. At the pinnacle of his military career, he held the position of Network Security Manager for some of the most highly classified computer networks spanning the globe. On January 1st of 2016, he achieved his childhood dream of becoming an author with the publishing of his debut novel, Rebirth. In August of that same year, he released his second stand-alone thriller, The Drift. Both books received the Readers' Favorite 5-Star Seal and continue to hold high ratings. Currently, he is working on three new novels - Reborn, the epic sequel to the dystopian thriller Rebirth, Cataclysm, an end-of-days saga, and Painfully Aware, where a battle for humanity is waged by a band of unlikely heroes.